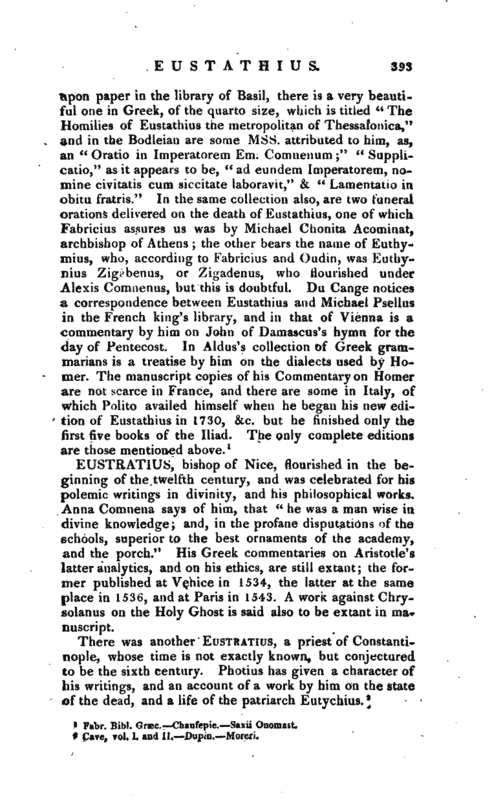 , a learned critic of the twelfth century, was born at Constantinople. 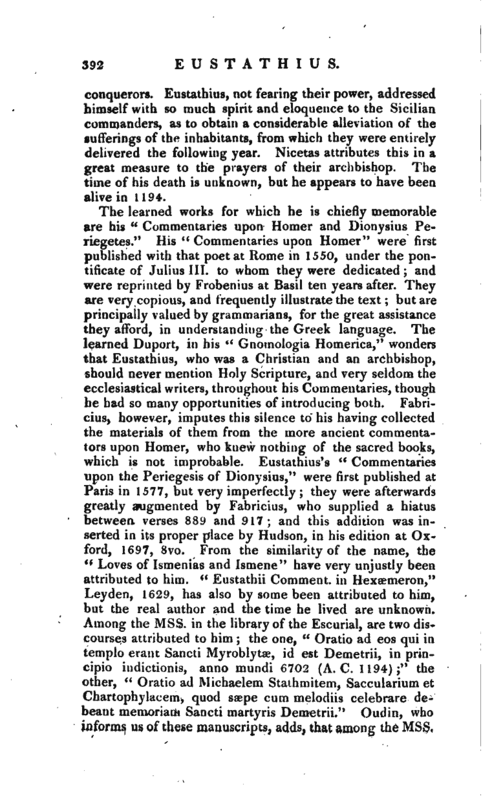 He was at first master of the rhetoricians (rhetorum magister), and afterwards deacon of the great church, under the patriarchate of Lucas Chrysobergus, who arrived at that dignity in 1155, and appears to have conferred many favours on Eustatius. Having been, elected bishop of Myra in Lycia, he had accepted the office, and was about to be consecrated, when the emperor Emanuel Comnenus sent a cong6 d’eLre to the synod, enjoining them to choose him archbishop of Thessalonica. In this he displayed great prudence, knowledge of business, and extensive learning, as appears by his works. In 1180 he was one of the prelates who remonstrated against the order of Emanuel Comnenus to erase from the Greek catechism, a censure of what is said of God by Mahomet in the Alcoran. Five years after, we find Eusebius displaying his spirit and regard for his flock in a remarkable manner. 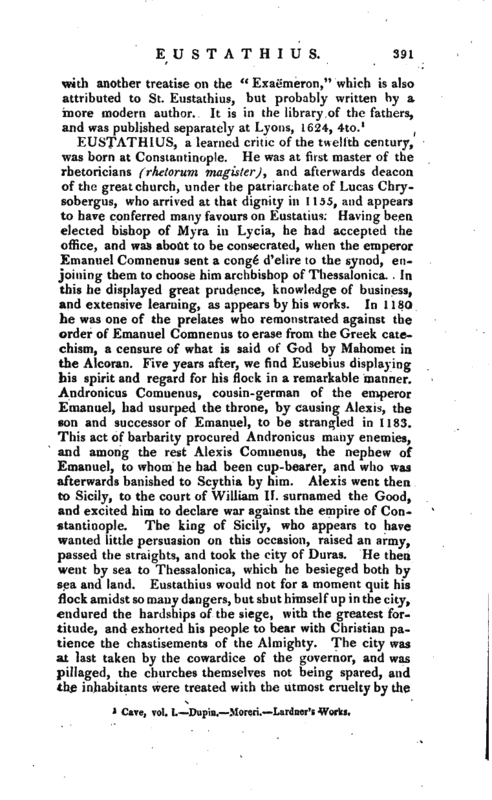 Andronicus Comnenus, cousin-german of the emperor Emanuel, had usurped the throne, fey causing Alexis, the son and successor of Emanuel, to be strangled in 1183. This act of barbarity procured Andronicus many enemies, and among the rest Alexis Comnenus, the nephew of Emanuel, to whom he had been cup-bearer, and who was afterwards banished to Scythia by him. Alexis went then to Sicily, to the court of William II. surnamed the Good, and excited him to declare war against the empire of Constantinople. The king of Sicily, who appears to have wanted little persuasion on this occasion, raised an army, passed the straights, and took the city of Duras. He then went by sea to Thessalonica, which he besieged both by sea and land. Eustatkius would not for a moment quit his flock amidst so many dangers, but shut himself up in the city, endured the hardships ofthe siege, with the greatest fortitude, and exhorted his people to bear with Christian patience the chastisements of the Almighty. The city was at last taken by the cowardice of the governor, and was pillaged, the churches themselves not being spared, and the inhabitants were treated with the utmost cruelty by the | conquerors. Eustathius, not fearing their power, addressed himself with so much spirit and eloquence to the Sicilian commanders, as to obtain a considerable alleviation of the sufferings of the inhabitants, from which they were entirely delivered the following year. Nicetas attributes this in a great measure to the prayers of their archbishop. The time of his death is unknown, but he appears to have been alive in 1194. Fabr. Bibl. Grace. —Chaufepie. Saxii Ouomast.